To the right of the figure's left shoulder: "F.v.Mieris/Ao 1661"
Images depicting the allegory of art were traditionally used to classify painting as one of the liberal arts. A woman, usually idealized, personifies Pictura (Painting) and holds objects vital to artistic creation. In her left hand she holds a palette, brushes, and a small plaster sculpture that served as a model for larger works. Around her neck she wears a mask on a chain, which may refer to art's ability to deceive through the art of illusion. 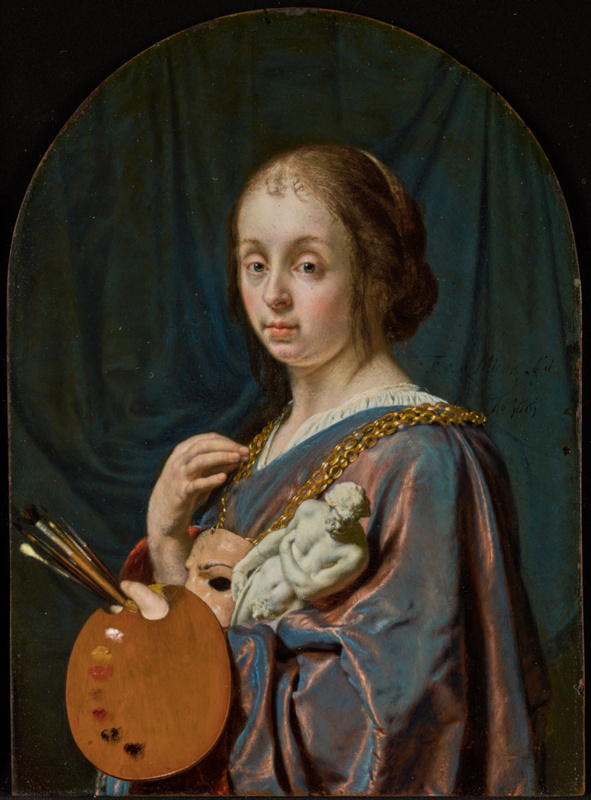 Frans van Mieris the Elder adopted the antique model of Pictura but updated it for his time. The model is not classically beautiful or idealized; she is an average young woman observed from everyday Dutch life. Van Mieris the Elder was Gerrit Dou's most promising student in the school of fijnschilders (fine painters) in Leiden in the 1600s. The highly finished quality of this painting is an excellent example of this style of painting. Source: Seen by Gerard de Lairesse before he went blind in 1690. Pierre Fouquet Jr., 1729 - 1800 (Amsterdam, The Netherlands), sold to Jean-Baptiste-Pierre Lebrun, 1773. Source: Recorded in collection 1781. Charles Ferdinand d'Artois, Duc de Berri, French, 1778 - 1820 (Paris, France), by inheritance to Marie-Caroline de Bourbon-Sicile, 1820. Source: Provenance Index: Collectors File: Recorded in posthumous inventory of 1820. Source: Provenance Index: 1834 sale from Collectors File. Charles A. Bredel, died 1851 (London, England), by inheritance to his daughters, Misses Bredel, 1851. Edward Charles Baring, first Baron Revelstoke, 1828 - 1897 (London, England), by inheritance to his son, John Baring, 1897. Dr. Cornelis Johannes Karel van Aalst, Dutch, 1866 - 1939 (Hoevelaken, The Netherlands), by inheritance to N. J. van Aalst, 1939. N. J. van Aalst, Dutch (Hoevelaken, The Netherlands; Breda, The Netherlands), by inheritance within the van Aalst family. Van Aalst Family, sold through Gustav Cramer to the J. Paul Getty Museum, 1982. Lairesse, Gérard de. Groot schilderboek, waar in de Schilderkonst in al haar deelen grondig werd onderweezen, ook door Redeneeringen en Prentverbeeldingen verklaard [...]. 2 vols. (Haarlem: Johannes Marshoorn, 1740), vol. 1, p. 175. Cok, Amsterdam. Catalogus van een zeer Ryk en Magnifiek Cabinet Schilderyen, van de beroemdste Italiaansche en Nederlandsche Meesters [...]. June 19, 1765, p. 10, lot 62. De Winter and Yver, Amsterdam. Catalogus van een uitmuntend en overheerlyk kabinet konstige schilderyen [...]. August 25, 1773, p. 61, lot 181. Rémy, Paris. Catalogue d'une très-belle collection de tableaux de maîtres très-renommés des différentes écoles, rassemblés par un Artiste. December 22-23, 1773, pp. 28-29, lot 60. Lairesse, Gérard de. The Art of Painting, in All its Branches, Methodically Demonstrated by Discourses and Plates, and Exemplified by Remarks on the Paintings of the Best Masters [...]. John Frederick Fritsch, trans. 2 vols. (London: S. Vandenbergh, 1778), vol. 1, p. 100. Le Brun, Jean-Baptiste-Pierre. Catalogue raisonné des tableaux, dessins, estampes, figures de bronze et de marbre [...] qui composoient le cabinet de feu M. Poullain [...]. March 15-17, 1780, pp. 38-39, lot 74. Basan, François. Collection de cent-vingt estampes, gravées d'apres les tableaux & dessins qui composoient le Cabinet de M. Poullain, Receveur Général des Domaines du Roi, décédé en 1780 (Paris: Chez Basan et Poignant, 1781), p. 11, no. 58, ill.
LeBrun, Paris. Catalogue d'une précieuse collection de tableaux, et d'objets rares et curieux [...] , Le tout provenant du Cabinet de M. le Duc de CH***. December, 10, 1787, p. 22, lot 39. Lairesse, Gérard de. Le grand livre des peintres, ou l'art de la peinture considéré dans toutes les parties, & démontré par principes [...]. 2 vols. (1787, repr., Geneva: Minkoff Reprints, 1972), vol. 1, p. 290. LeBrun, Julliot, Boileau, Paris. Catalogue d'une collection très-précieuse de tableaux des écoles flamande, hollandoise et allemande [...] composant le Cabinet du Citoyen Destouches. March 21, 1794, p. 23, lot 48. Paillet, Destouches, Paris. Catalogue d'une réunion précieuse de tableaux, par les plus grands maîtres des écoles d'Italie, de France, de Hollande et de Flandre [...]. December 14-15, 1808, pp. 32-33, lot 48. Élie, Fournel, Paris. Catalogue de tableaux, estampes et bronzes, composant le cabinet de M. P*** [...]. March 4-5, 1816, pp. 16-17, lot 28. Smith, John. A Catalogue Raisonné of the Works of the Most Eminent Dutch, Flemish, and French Painters [...]. 9 vols. (London: Smith and Son, 1829-42), vol. 1 (1829), pp. 71, 81, nos. 36, 77. Christie, Manson, and Christie's, London. A Catalogue of the Matchless Collection of Dutch and Flemish Pictures, of His Late Royal Highness The Duke de Berri [...]. April, 1834, pp. 29-30, lot 57. Paillet, Bataillard, Paris. Catalogue descriptif des tableaux de l'école hollandaise, flamande et française, provenant de l'ancienne galerie du Palais de l'Elysée. April 4-6, 1837, p. 73, lot 68. Smith, John. A Catalogue Raisonné of the Works of the Most Eminent Dutch, Flemish, and French Painters [...]. 9 vols. (London: Smith and Son, 1829-42), vol. 9 (1842), p. 41, no. 22. Christie's, London. Catalogue of the Beautiful Collection of Pictures of the Very Highest Class, of William Williams Hope, Esq., Partly from Rushton Hall, Northamptonshire [...]. June 14-16, 1849, p. 23, lot 84. Catalogue of Pictures by Italian, Spanish, Flemish, Dutch, French and English Masters [...], exh. cat. (London: British Institution, 1850), p. 10, no. 70. Catalogue of Pictures by Italian, Spanish, Flemish, Dutch, French, and English Masters [...], exh. cat. (London: British Institution, 1863), p. 11, no. 90. Christie, Manson & Woods, London. Catalogue of the Choice Collection of Ancient & Modern Pictures, of the Rev. John Lucy, Deceased, also the Very Choice and Well-Known Bredel Collection of Ancient and Modern Pictures, Formed many Years ago, with profound Judgment and most refine Taste, by the late Charles Bredel, Esq., who died in 1851 [...] (London: Christie, Manson & Woods, 1875), p. 21, lot 118. Marsy, Alexandre Charles Arthur, Comte de. Balthasar de Monconys: Analyse de ses voyages au point de vue artistique (Caen: F. Le Blanc-Hardel, 1880), p. 31 (possibly Getty painting). Hofstede de Groot, Cornelis. Beschreibendes und kritisches Verzeichnis der Werke der hervorragendsten holländischen Maler des XVII. Jahrhunderts. 10 vols. (Esslingen am Neckar: Paul Neff Verlag, 1907-28), vol. 10 (1928), p. 6, no. 26. Christie, Manson & Woods, London. Catalogue of Ancient and Modern Pictures and Drawings, the Property of the Rt. Hon. Lord Revelstoke, P.C., G.C.V.O. deceased; late of 3 Carlton House Terrace, S.W.1; the property of Sydney Morse, Esq. deceased, late of 14 Arlie Gardens, W.1; and from other sources. July 26, 1929, p. 12, lot 65.
von Moltke, J. W., ed. Dutch and Flemish Old Masters in the Collection of Dr. C. J. K. van Aalst, Huis-te-Hoevelaken, Holland (Verona: 1939), p. 202, ill.
17e eeuwse meesters uit Gelders bezit, exh. cat. (Arnhem: Gemeentemuseum, 1953), p. 16, no. 41, ill.
Gelder, Jan Gerrit van. De Schilderkunst van Jan Vermeer: Een voordracht (Utrecht: Kunsthistorisch Instituut, 1958), p. 13, fig. 10. Badt, Kurt. Modell und Maler von Jan Vermeer. Probleme der Interpretation: eine Streitschrift gegen Hans Sedlmayr (Cologne: M. DuMont Schauberg, 1961), p. 110. De Schilder in zijn wereld van Jan Van Eyck tot Van Gogh en Ensor, exh. cat. (Delft: Stedelijk Museum 'het Prinsenhof, 1964), pp. 76-77, no. 80, fig. 36. Wurfbain, M. L. "Portret van Cuniera van der Cocq, Frans van Mieris de Oude, 1635-1681." Vereniging Rembrandt: Nationaal Fonds Kunstbehoud (1980), pp. 55. Naumann, Otto. Frans van Mieris (1635-1681) the Elder. 2 vols. (Doornspijk: Davaco, 1981), vol. 1, vol. 1, p. 69. Naumann, Otto. Frans van Mieris (1635-1681) the Elder. 2 vols. (Doornspijk: Davaco, 1981), vol. 2, pp. 26, 48-49, no. 37, pl. 37. Bol, Laurens J. "Remarkable Monography on Frans van Mieris the Elder." Tableau 4 (January-February 1982), p. 387, ill.
A Collector's Choice, exh. cat. (The Hague: Mauritshuis, 1982), pp. 150-51, no. 55, ill.
Sillevis, John. Review of A Collector's Choice. Mauritshuis, The Hague. The Burlington Magazine 124, no. 947 (February 1982), pp. 122, 125, fig. 71. Schwartz, Gary. "Dealing a private hand." Art News 81, no. 5 (May 1982), pp. 152, 154, ill.
Dolders, Arno. "Some Remarks on Lairesse's Groot schilderboek." Simiolus 15, no. 3/4 (1985), pp. 215-16, fig. 4. Sutton, Peter C. A Guide to Dutch Art in America (Grand Rapids: Wm. B. Eerdmans, 1986), p. 144. Gaehtgens, Barbara. Adriaen van der Werff 1659-1722 (Munich: Deutscher Kunstverlag, 1987), p. 370, fig. 108a. Hecht, Peter. De Hollandse Fijnschilders van Gerard Dou tot Adriaen van der Werff, exh. cat. (Amsterdam: Rijksmuseum, 1989), pp. 15-16, 82-85, no. 14, ill.
Baer, Ronni. "Dutch 'Fine-painting." Apollo 131, no. 337 (March 1990), pp. 186-87, fig. 1. Gaskell, Ivan. Review of Great Dutch Paintings from America. Rijksmuseum, Amsterdam. The Burlington Magazine 132, no. 1044 (March 1990), p. 228, fig. 75. Broos, Ben. Great Dutch Paintings from America, exh. cat. (The Hague: Mauritshuis, 1990), pp. 124-25, 339-45, no. 44, ill.
Sutton, Peter C. "Recent Patterns of Public and Private Collecting of Dutch Art." In Great Dutch Paintings from America, exh. cat. Ben Broos et al., eds. (The Hague: Mauritshuis, with Waanders, 1990), p. 107. Carr, Dawson W., and Mark Leonard. Looking at Paintings: A Guide to Technical Terms (Malibu: J. Paul Getty Museum, with British Museum Press, 1992), p. 84, ill.
Jongh, E. de. Faces of the Golden Age: Seventeenth Century Dutch Portraits, exh. cat. (Yamaguchi City: Yamaguchi Prefectural Museum of Art, 1994), pp. 111-12, fig. 19b. Edwards, JoLynn. Alexandre-Joseph Paillet: Expert et marchand de tableaux à la fin du XVIII siècle (Paris: Arthena, 1996), p. 332, no. 60. Jaffé, David. Summary Catalogue of European Paintings in the J. Paul Getty Museum (Los Angeles: J. Paul Getty Museum, 1997), p. 85, ill.
Komanecky, Michael K., ed. Copper as Canvas: Two Centuries of Masterpiece Paintings on Copper, 1575-1775, exh. cat. (Phoenix: Phoenix Art Museum, 1998), pp. 84, 237-40, no. 39, ill.
Horovitz, Isabel. "The Materials and Techniques of European Paintings on Copper Supports." In Copper as Canvas: Two Centuries of Masterpiece Paintings on Copper, 1575-1775, exh. cat. (Phoenix: Phoenix Art Museum, 1998), p. 84. Wheelock, Arthur K., Jr. Johannes Vermeer: The Art of Painting, exh. brochure (Washington, D. C.: National Gallery of Art, 1999), unpaginated, fig. 12. Hecht, Peter. Gelukkige momenten en gemiste kansen (Amsterdam: Vereniging Rembrandt, 2000), pp. 24-25, fig. 6. The J. Paul Getty Museum Handbook of the Collections. 6th ed. (Los Angeles: J. Paul Getty Museum, 2001), p. 123, ill.
Buvelot, Quentin, et al., eds. Frans van Mieris, 1635-1681, exh. cat. (The Hague: Royal Picture Gallery Mauritshuis, 2005), pp. 110, 148-51, 181, 228, no. 27, ill., entry by Quentin Buvelot. Chapman, H. Perry. "The Imagined Studios of Rembrandt & Vermeer." In Inventions of the Studio: Renaissance to Romanticism. Michael Cole and Mary Pardo, eds. (London: University of North Carolina Press, 2005), pp. 136-37, fig. 4.18. Buvelot, Quentin. "Frans van Mieris' Reputation." In Frans van Mieris, 1635-1681, exh. cat. Buvelot, Quentin, et al., eds. (The Hague: Royal Picture Gallery Mauritshuis, 2005), pp. 15, 21, 35. Jongh, Eddy de. "Frans van Mieris: Questions of Understanding." In Frans van Mieris 1635-1681, exh. cat. Quentin Buvelot, ed. (The Hague: Mauritshuis, 2005), pp. 45, 61. The J. Paul Getty Museum Handbook of the Collections. 7th ed. (Los Angeles: J. Paul Getty Museum, 2007), p. 117, ill.
Hecht, Peter, ed. 125 Jaar openbaar kunstbezit: met steun van de Vereniging Rembrandt, exh. cat. (Amsterdam: Van Gogh Museum, with Waanders and Vereniging Rembrandt, 2008), p. 144, fig. 199. Leuschner, Eckhard. "Allegorische Diskurse: Bildsprachen der Maske in der Europäischen Kunst der Frühen Neuzeit." In Wir sind Maske, exh. cat. Sylvia Ferino-Pagden, ed. (Vienna: Museum fur Völkerkunde, 2009), pp. 310-11, fig. 7. Pénot, Sabine. "Johannes Vermeer, 'Die Malkunst': Ein Gemälde im Zeichen des Lichtes; Fragen zur Bilderfindung." In Vermeer, Die Malkunst: Spurensicherung an einem Meisterwerk, exh. cat. Sabine Haag, Elke Oberhaler and Sabine Penot, eds. (Vienna: Kunsthistorisches Museum, with Residenz Verlag, 2009), pp. 45, 273, fig. 4. Smith, David R. "Vermeer and Iconoclasm." Zeitschrift für Kunstgeschichte 74, no. 2 (2011), p. 206, fig. 9. Vanvidere, Abby, and Mark Clarke. "Changing Drapery, Recipes and Practice." In Vision and Material: Interaction between Art and Science in Jan van Eyck's Time. Marc De Mey, et al., eds. (Brussel: KVAB Press, 2012), pp. 248-49, fig. 12.14. Bikker, Jonathan. "The hidden collection of the spectacularly bankrupt banker Leendert Pieter de Neufville." Simiolus 36, no. 3/4 (2013), p. 195, fig. 20. Reynolds, Anna, Lucy Peter and Martin Clayton, eds. Portrait of the Artist, exh. cat. (London: The Queen's Gallery, Buckingham Palace, with Royal Collection Trust, 2016), p. 184, fig. 38, entry by Anne Reynolds.